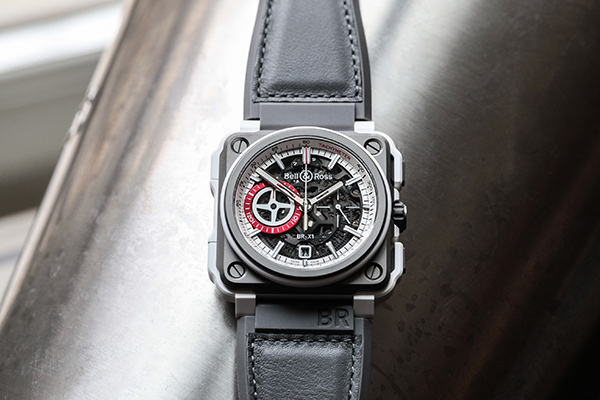 Reference in aeronautical watches, Bell & Ross unveils its BR-X1 White Hawk line. Its name in French, Faucon Blanc, evokes dreams and travels. These two models with sophisticated watchmaking finishes take inspiration from the colors of private jets. 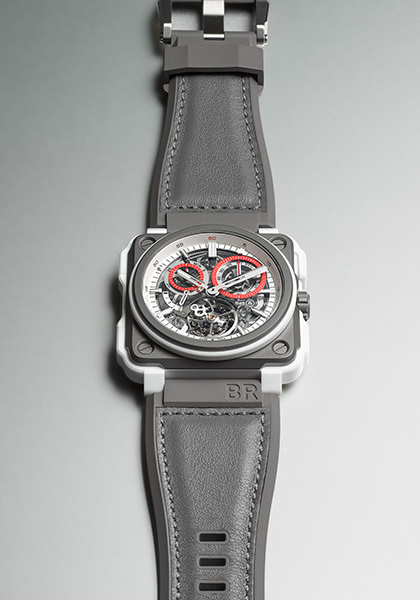 The BR-X1 and the BR-X1 Tourbillon White Hawk are totally revolutionary in their construction. These measuring instruments combine Bell & Ross’ virile aesthetic codes with the technical refinement of its high-end watchmaking. While the BR-X1 White Hawk is powered by a calibre BR-CAL.313 self-winding mechanical movement, the BR-X1 Tourbillon White Hawk is powered by a calibre BR-CAL.283 hand-wound mechanical movement. The strap is however the same on both models. Made with rubber and grey calfskin, a pin buckle fastens it. The BR-X1 White Hawk has metal applique indices and metal skeletonised hour and minute hands filled with Superluminova®. This timepiece indicates hours and minutes but is also equipped with a small second at 3 o’clock and a skeletonised date display at 6 o’clock. The chronograph function is ensured by a 30-min timer at 9 o’clock and a central seconds hand. Sword-style hands, also coated in the vintage-looking Super-LumiNova, are again reminiscent of WWII era pilot watches from makers more older than Bell & Ross. At six o’clock we find a red circle with “M T” (to endure “Army Form”) printed inside to mimic the reddish colored 3H (which called tritium or Hydrogen-3 for a lume origin) markers found on elderly German military watches such as those made by Heuer and issued into the German Air Force. A 38.5millimeter case width keeps things sense vintage and the small size must allow for comfortable wear on wrists of several sizes. Ironically, many of the watches the Bell & Ross V1-92 appears to draw inspiration from were giant (as big as 55mm) having been made to be worn over a pilot’s thick coat. Bell & Ross definitely know that the modern marketplace has a place for those who love antique styling with a more wearable presence. The new Bell & Ross V1-92 Military also shares its motion with the rest of the V1 collection. The BR-X1 Tourbillon White Hawk indicates hours and minutes with metal skeletonised Superluminova®-filled hands and metal applique indices are filled with the same liquid. This chronograph includes a 30-min timer at 11 o’clock abd a 60-sec timer at 1 o’clock. This model is also equipped with a flying tourbillon at 6 o’clock and a power reserve indicator at 9 o’clock. These two alternative models have a grade 5 microblasted titanium case covered with a matt white ceramic «belt». The white and grey of the case depict the colors of the private jets. The push buttons are made of high-tech ceramic with rubber inserts to optimize their grip and strength. A rubber button grip insert is also built into the case at 9 o’clock to enhance the activation of the chronograph’s functions and a red rim highlights them for optimal readability. This fundamental complication enables short time measurements and is an indispensable tool for air navigation.